Suscram Blyth Route - Suscram. Set off from B gate and turn right at the cycle track, passing Alexandra park playground on the right and when the cycle track splits in two, keep left. Follow the track all the way up untill you reach Cramlington centre. Turn right on the footpath and cut through past the Village Chinese takeaway to the war memorial. Cross the road and head down the cycle path. Parkside school will be on your left. Continue passing Shanklea Primary and Burnside schools. After Burnside school, follow the cycle track round to the right. You will pass several football pitches on your right. Now follow the cycle signs in the direction of Blyth. You will reach the B1505. Turn left here and in 50 metres you will reach a T junction with the A192. Cross the road and go under the bridge and follow the B1505 right, towards Horton. At the cross roads continue straight on towards the Three Horseshoes pub. Follow the road to the left of the Three Horseshoes pub and head North passing the site of Bebside Colliery. You will come to a junction with Bebside motors on your left. Turn right at the road for about 100 metres and take a left at Font street and follow this road all the way and you will reach quite a steep hill. Go down this but do not go across the bridge, go through a little cut in the field to the right. 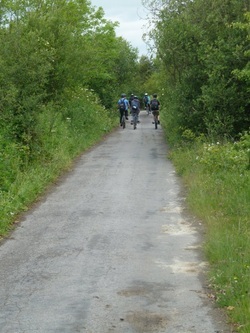 Follow this path untill you reach some streets and you will see a sign for the NCN cycle route 1. Follow these signs all the way to South Beach. This be an ideal place to have a break and a plate of chips! There are toilets and a cafe. After your break head up the Laverock Road untill you reach about the third set of lights, cross at the lights and continue up the road untill you reach Cramlington. Find the cycle paths and re-trace your route that marked the beginning of your cycle ride. Head down the coast towards Seaton Sluice on a cycle path that cuts through the sand dunes. When you arrive a Seaton Sluice, cross over the road bridge and turn right to pass through a gate. The track descends towards the river. As the path begings to level out you will pass over a bridge under which runs the route of the Blyth and Tyne (avenue branch). Continue straight on until you arrive in Holywell village. Follow that paths all the way up the dene until you reach car park. Go through the car park and follow the road, the B1325, to the right. The road heads down to a bridge. Go over the bridge, ignore the first footpath on the left and look for the second path on your left. this bridle path runs along the edge of the dene separating the trees from the field. As the path begings to level out you will pass over a bridge under which runs the route of the Blyth and Tyne Railway(avenue branch). Continue straight on until you arrive in the centre of Holywell village. Follow the road steeply down to the road bridge that passes over Holywell dene. Before the bridge take the track to the right and follow it along the southern edge of the dene. The track bends round to the right and follow it in a southernly direction for 100 metres. Take the first track on the right for 200 metres and then right again to head back in a northerly direction and across the dene. There are two tracks very close to each other that head north. The first descends into the dene and goes across a footbridge. There are some good jumps here! The second track follows the route of a wagonway ( the Backworth Colliery wagonway, East Holywell branch. ) and crosses the dene on an embankment and so avoids any steep ascents. After crossing the dene turn left and follow the path along the edge of a housing estate. At the top of the dene follow a path to the right for 20 metres and then left on to a path that follows the boundry of the Proctor and Gamble factory complex. At the junction with the A190 continue straight over the roundabout and follow the quiet road to Mare Close farm. You will pass Seghill Holy Trinity church on your right. After the church you will cross over the mineral railway and onto a track to Middle Farm. Turn right at the junction and head towards the farm buildings.Then bear left on to a track that will lead on to the route of the West Cramlington Waggonway. Look out for the Big Spoon! Follow this under the Spine Road and through Southfield and back to the playground opposite Cramlington Learning Village.